Here’s what Moving to Las Vegas is really like. When people think of Las Vegas, they picture slot machines, glitzy casinos, themed hotels and entertainment extraordinaire. However, there is a lot more to this world-famous getaway destination, and nearly 2 million people valley-wide call Las Vegas home. If you are thinking about relocating to Vegas, here are ten things you should know. Despite the negative stereotypes of “Sin City,” Las Vegas is mostly just like any other city. It has great places to shop, eat out, watch a movie, or get a haircut. It has churches, parks, schools and businesses. There are many pleasant new suburban communities as well as great old and established neighborhoods in and around Las Vegas that offer all the amenities of any normal home town and still provide close proximity to the area’s many cultural attractions. As you’d expect, a lot of Las Vegas jobs are within the hospitality and gaming industries, as well as other local services that support the growing valley. But there’s a lot more going on in Las Vegas. There’s the Downtown Project, a $350 million revitalization and support system for small tech startups, making the old downtown Las Vegas a great place for new entrepreneurs to incubate and grow an innovative idea. The downtown is also a hub for artists and musicians and sports a lively nightlife and arts scene that is popular with local Las Vegans. While Las Vegas is still working on diversifying its economy with manufacturing and other industries, companies involved in IT and healthcare provide a growing number of jobs as well. For more information about employment, visit the Nevada Workforce website and the VegasTechFund job board. The cost of living in Las Vegas is remarkably affordable, with most things coming in comparable to the national average. Food costs tend to be a little bit higher because not much is locally grown. Housing and rents are very affordable and there’s a wide choice of affordable living options, from apartments to mansions. Hipsters are flocking to the trendy Downtown area, where they are helping revive some old classic buildings and neighborhoods. There are also a number of quieter 55+ retirement communities that offer retirees a great relaxed desert lifestyle. Not only does the state of Nevada have no income tax, it also has the lowest taxes in the nation. Basically, tourists dropping money into the casino slots fund most of the state’s needs, like roads, parks, schools and local services. But, like many states, Nevada does have a sales tax on retail purchases. Nevada is also one of the easiest places in the country to open a new business. Unless you enjoy walking in 100+ degree weather to go shopping, you will need a car. Parking is readily available and usually free. When navigating Las Vegas as a resident, you’ll want to avoid the Strip due to traffic congestion. For people used to lots of traffic jams, traffic congestion in Las Vegas in general is pretty mild, except for parts of the freeways at commute times to and from the Strip. Other transportation options include cycling or public transportation with the RTC (Regional Transportation Commission) which provides reliable service on comfortable, air-conditioned buses. The good news is that Las Vegas enjoys more than 300 days of sunshine each year. East Coasters and people from hot and humid climates appreciate the lack of snow and lack of humidity. The average annual temperature in Las Vegas is a perfect 69 degrees. Of course, this “average” is made up of highs in the 100’s and winter lows can dip into the 20’s, though 40’s is most typical. Winters are generally short and mild. Hot weather can last from May to October, but locals adapt by drinking lots of water and scheduling their outdoor activities in the evenings and early mornings. With an annual precipitation of only 4.17 inches, Las Vegas is truly a desert, and xeriscaping and water conservation are part of daily life. About the biggest weather event Las Vegas gets is infrequent but heavy rain in the summer monsoon season. With the hard desert soil, heavy rain can cause localized flooding, but the area has done a great job of redirecting desert flood waters away from most homes and businesses. A word of warning: the hot and dry climate may cause Vegas Throat, especially with newcomers, but it usually goes away as you adapt to the dry air. Education is a hot issue in Las Vegas. Nevada K-12 schools are not ranked highly compared to other states. This could be a legacy of the service job culture where most workers didn’t need a lot of schooling. There are some good individual schools, of course, including great arts and technology magnet schools, and a number of good private schools. UNLV, along with UNR, are the state’s two universities. UNLV is well known for its world-class hospitality training program. Las Vegas is a true melting pot. Most Las Vegans are transplants from somewhere else who come for fun, sun and the live-and-let-live mentality of this state born of the “Wild West”. Las Vegas draws an astonishingly diverse group of people from all over the US and the world for both work and play. Expect to hear Russian, Tagalog, Spanish, or Chinese as you go about your business. Visit Las Vegas Chinatown and plan to dine on some of the best Korean, Japanese and Vietnamese food that you have ever tasted. Las Vegas has grown up a lot in recent times. It now boasts numerous cultural venues such as the new art deco Smith Center, home of the Las Vegas Philharmonic Orchestra, but also a venue for everything from ballet to jazz to stand-up comedy. Find out more about the area at the Las Vegas Museum of Natural History. The Neon Museum’s Boneyard is where old neon signs go when they die and is a true walk through Las Vegas’ past. 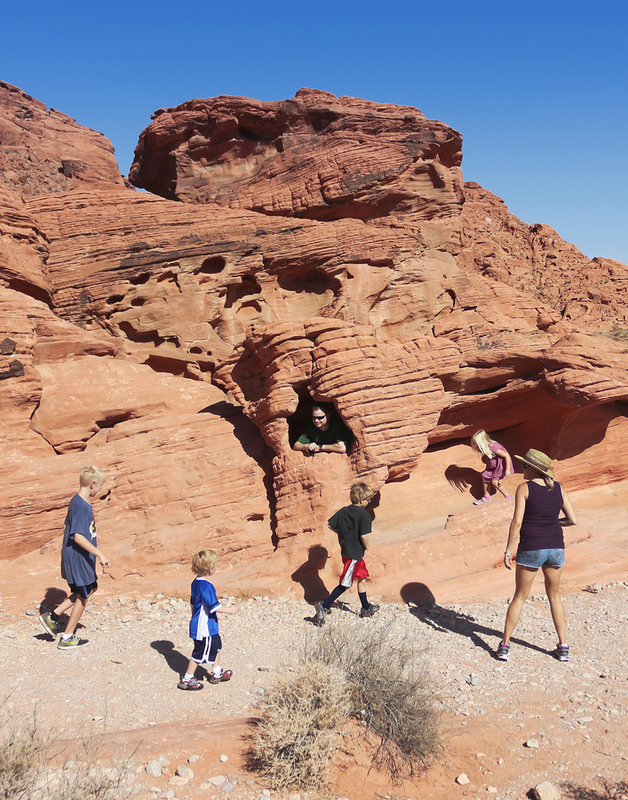 Here are our favorite family-friendly outings in Las Vegas. Outdoor life is great in Las Vegas. Besides the numerous golf courses and swimming pools, there are great neighborhood parks where soccer tournaments are really big for the kids. The area also boasts lots of dog parks and walking trails. Lake Mead is great for boating, picnicking and bird watching. There’s also the majestic Red Rock Canyon National Conservation Area for hiking only minutes out of town, and the stunning Valley of Fire State Park is nearby as well. And of course, when your friends and family come to town, there’s the Strip, but you know all about that. Las Vegas is still a show town. You might run into Elvis almost anywhere. Captain Jack Sparrow may surprise you as you both get a cold one at 7-11. Feather-clad women may share the line with you in the grocery store. And, you could just run into any one of a number of celebrities as you go about your everyday business. Lots of crazy things happen in Vegas, but you eventually learn to expect the unexpected. But that’s life in Vegas. From our family at Move 4 Less, where we give you a top quality, professional move experience at a great price with no surprises, welcome to Las Vegas! 10 Tips for Packing Your Electronics Need a Mover in Las Vegas with Great Reviews?